CAIRO — U.S. Secretary of State Mike Pompeo delivered a scathing rebuke of the Obama administration’s Mideast policies on Thursday, accusing the former president of “misguided” and “wishful” thinking that diminished America’s role in the region, harmed its longtime friends and emboldened its main foe: Iran. 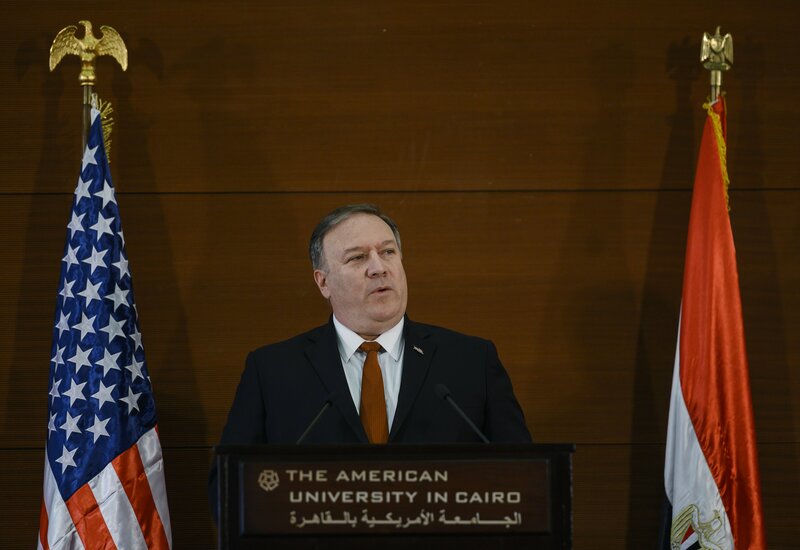 In a speech to the American University in Cairo, Pompeo unloaded on President Donald Trump’s predecessor, saying he was naive and timid when confronted with challenges posed by the revolts that convulsed the Middle East, including Egypt, beginning in 2011. Pompeo laid the blame notably on a vision outlined by President Barack Obama in a speech he gave in Cairo in 2009 in which he spoke of “a new beginning” for U.S. relations with countries in the Arab and Muslim world. Former Obama administration officials rejected Pompeo’s assertions as petty, political and weak. They said the speech pandered to authoritarian leaders and ignored rights violations that Obama had called out. Rob Malley, who was Obama’s national security council director for the Middle East and is now at the International Crisis Group, said hearing Pompeo’s speech was like “like listening to someone from a parallel universe” in which the region’s shortcomings were ignored. Since Trump’s election, however, Pompeo claimed this was all changing. In the speech entitled “A Force for Good: America’s Reinvigorated Role in the Middle East,” Pompeo extolled the Trump administration’s actions across the region cementing ties with traditional, albeit authoritarian, friendly governments, taking on the Islamic State group in Iraq and Syria and imposing tough new sanctions on Iran.